The Persistence Market Research report on global African Mango Seed Extract market analyzes opportunities in the market and presents updates and insights pertaining to various segments of the global African Mango Seed Extract market over the forecast period, 2018–2026. This report provides forecast and analysis of the global African Mango Seed Extract market. It provides historical data from 2013 to 2017 along with estimated data of 2018, and forecast data up to 2026 in terms of revenue (US$ Mn). The report also includes macroeconomic indicators along with an outlook on African Mango Seed Extract for global market. It includes drivers and restraints of the global African Mango Seed Extract market and their impact on each region during the forecast period. The report also comprises the study of current issues with consumers and opportunities for African Mango Seed Extract products. It also includes value chain analysis. In order to provide users of this report with comprehensive view of the market, we have included detailed competitiveness analysis and market key players and strategy overview. The study encompasses market attractiveness analysis by nature, end use, function, distribution channel and region. The report includes African Mango Seed Extract market company profiles and the revenue generated from the companies across North America, Latin America, Europe and APAC. The African Mango Seed Extract market is segmented on the basis of nature, end use, function, distribution channel and region. On the basis of nature, the global African Mango Seed Extract market is segmented into organic and conventional. The organic segment is expected to represent the most lucrative market growth rate in the global African Mango Seed Extract market in terms of both value and volume resulted by growing trend of natural and organic based food and beverages. On the basis of end use, the global African Mango Seed Extract market is segmented into dietary supplements, functional food and beverages, pharmaceutical industry and cosmetics & personal care. On the basis of function, weight management segment is expected to dominate the global African Mango Seed Extract market by 2026 owing to growing obese population especially in North America and European countries. On the basis of distribution channel, the global African Mango Seed Extract market is segmented into direct and indirect channel. The indirect segment is further sub segmented into hypermarket/supermarket, pharmacy stores and online stores. This report covers trends driving each segment and offers analysis and insights into the potential of the African Mango Seed Extract market in specific regions. Detailed profiles of the providers are also included in the scope of the report to evaluate their long-term and short-term strategies, key offerings and recent developments in the African Mango Seed Extract space. African Mango Seed Extract key players include Z Natural Foods LLC, Xian Yuensun Biological Technology Co.,Ltd., Qingdao BNP Co. Ltd, Shaanxi I/E Biological Technology Co., Ltd., Xian Shunyi Bio-Chemical Technology Co.,Ltd, Apex Biotechnol, Xi'an Le Sen Bio-technology Co.,Ltd, Panacea Phytoextracts Pvt. Ltd., Clover Nutrition Inc. and Naturalin Bio-Resources Co. Ltc. To deduce the market size, the report considers the total production of African Mango and its derivatives. Furthermore, key data points such as region-wise split and market split by nature, end use, function, distribution channel and region from primary respondents have been incorporated to arrive at appropriate market estimates. A number of primary and secondary sources were consulted during the course of the study. Secondary sources include World Agroforestry, FAOSTAT, regional annual production of African Mango and the consumption rate of the African mango kernels. The forecast presented in the report assesses total revenue generated and expected revenue contribution by the global African Mango Seed Extract market. The report begins with sizing the base year in terms of value and volume through the determination of the total consumption of African mango, quantity of kernel being consumed and total quantity of kernel used for the production of kernel extract. This also forms the basis for forecasting the market growth in the near future. Given the characteristics of the market, Persistence Market Research triangulates the data via different analysis based on supply side, demand side, and dynamics of the global African Mango Seed Extract market. To develop the market forecast, PMR also conducted factor analysis to understand the impact of various forces/factors on the target market. However, quantifying the market across the abovementioned segments is more a matter of quantifying expectations and identifying opportunities rather than rationalizing them after the forecast has been completed. Another key feature of this report is analysis of the global African Mango Seed Extract in terms of absolute dollar opportunity. This is usually overlooked while forecasting the market. However, absolute dollar opportunity is critical in assessing the level of opportunity that a producer can look to achieve, as well as to identify potential resources from a sales perspective in the global African Mango Seed Extract market. To understand key segments in terms of their growth and performance in the global African Mango Seed Extract market, Persistence Market Research has developed a market attractiveness index. The resulting index should help producers identify existing market opportunities in the global African Mango Seed Extract market. The report covers an in-depth analysis of all components of value chain in the global African Mango Seed Extract market. In the final section of the report on the global African Mango Seed Extract market, competitive landscape is included to provide a dashboard view of the key producers in the African Mango Seed Extract market. Persistence Market Research offers an eight-year forecast for the global African Mango Seed Extract market between 2018 and 2026. In a recently released report by the company, the global African Mango Seed Extract market is expected to register a CAGR of 3.7% during the forecast period. The primary objective of the report is to offer insights on the advancements and opportunity in the African Mango Seed Extract market. The study demonstrates market dynamics that are expected to influence the current challenges and future status of the global African Mango Seed Extract market over the forecast period. This report also offers updates on trends, drivers, restraints, value forecasts, and opportunities for manufacturers operating in the global and regional African Mango Seed Extract market. The scope of our study for African Mango Seed Extract includes commercially as well as domestically important African Mango Seed Extract available in the market. The global African Mango Seed Extract market by nature is segmented into organic and conventional. The organic segment is anticipated to grow at highest CAGR in the global African Mango Seed Extract market over the forecast period owing to rising demand for organic products especially in North American and European region. Consumers across the globe are demanding for food and beverages with natural ingredients which is pushing the revenue generation in the organic segment in the near future. 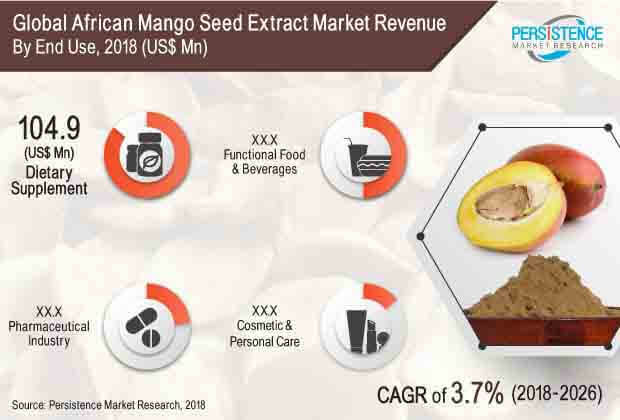 The global African Mango Seed Extract market by end-use is segmented into dietary supplements, functional food & beverages, pharmaceutical industry and cosmetics & personal care. The dietary supplements segment is expected to grow at a robust rate over the forecast period due to rise in number of obese population especially in the North American and European region. The global African Mango Seed Extract market by function is segmented into weight management, heart health management and therapeutic treatment. The function of weight management is expected to have higher value share over the forecast period. The African Mango seed extract is commercially known for its weight loss properties that it possess due to which regions having higher density of obese population has been demanding for products having weight loss properties. Due to this factor, the weight management segment have higher value share as compared to other segments. By distribution channel, the global African Mango Seed Extract market is segmented into, direct and indirect channel. The indirect channel is further segmented into hypermarket/supermarket, pharmacy stores and the online store. Due to rise in demand for African Mango seed extract from the dietary supplements manufacturers as well as the functional food and beverages segments, the distribution through direct channel is expected to grow at faster rate as compared to indirect channel over the forecast period. The report includes market share of each segment according to the region with analysis towards market trends respectively. By region the global African Mango Seed Extract market is segmented into, North America, Latin America, Europe, Asia Pacific and Middle East & Africa. A section of the report highlights the global demand for African Mango Seed Extract demand. It also provides a market outlook for 2018–2026 and sets the forecast within the context of the Nutraceutical segment, including the new product developments as well as product offerings in the global African Mango Seed Extract Market. This study discusses key trends contributing to the growth of the global African Mango Seed Extract market, as well as analyses the degree to which drivers are influencing the global market. In the final section of the report, a competitive landscape has been included to provide report audiences with a dashboard view. Key categories of providers covered in the report are global African mango seed extract key players. Detailed profiles of the providers are also included in the scope of the report to evaluate their long-term and short-term strategies, key offerings and recent developments in the global African Mango Seed Extract space. Xian Yuesun Biological technology Co. Ltd.